Thursday 28 June 2018: The story of the day came from ABB (Stand E8060), which announced that it has signed a memorandum of understanding with Ballard Power Systems to jointly design, develop and validate a next-generation zero-emission fuel-cell powerplant for the shipping industry. Both companies will leverage existing kilowatt-scale fuel-cell technologies and optimise them to create a megawatt-scale solution for powering larger ships such as passenger vessels. With an electrical generating capacity of 3MW (equivalent to 4,000hp), the new system will fit within a single module similar in size to a conventional diesel engine. During the initial phase, the collaboration will focus on the development of proton exchange membrane fuel cells (PEM), which convert chemical energy from hydrogen into electricity, heat and clean water, and provide power for hotel operations during docking and for propulsion when at sea. “The next generation of ships – electrical, digital and connected – will require energy sources that are not only able to meet the increasing demands for fuel efficiency, but will also enable cleaner and safer shipping,” said Peter Terwiesch, president of ABB’s industrial automation division, which is already actively involved in collaborative development of fuel-cell technology for marine applications, including research, testing and a pilot installation implementation. Another big news story live from the floor of Electric & Hybrid Marine World Expo came from Italian power transmission manufacturer Transfluid (Stand E6000), which announced it has acquired 100% of the shares in IDTechnology, owner of the Bellmarine brand, a Dutch electric propulsion system developer for commercial boating applications. According to Ugo Pavesi, CEO of Transfluid, the acquisition will enable the company to expand its range of electric propulsion products and present new solutions that cover all requirements for electric and hybrid powertrains for any kind of marine, inland water or offshore application. Under the terms of the acquisition, Bellmarine will continue to operate from its base in the Netherlands under its current brand identity; however, Transfluid will look to grow Bellmarine’s presence internationally. “We want to help Bellmarine to start selling in markets worldwide, such as in the USA, so taking advantage of our own sales network is what we will do first,” added Pavesi. “Then, in following years, we will establish a production synergy.” Pavesi also confirmed that Marien Schoonen, founder of Bellmarine, will continue at the company, focusing on sales and product development. Meanwhile, over on the Xalt Energy stand (E3060), the US lithium-ion cell and battery systems manufacturer not only debuted its new XRS XPAND battery rack system, but also announced that the XPAND battery system the rack is designed for has been certified as acceptable for installation on all marine vessels classified by DNV GL. Visitors to the 2018 Electric & Hybrid Marine World Expo can find out more about this and the XRS XPAND battery rack system, which incorporates XPAND battery packs and battery management systems in modular, expandable racks. A typical rack contains two strings of 10 series-connected packs, with an operating voltage up to 1,000V and total energy up to 222kWh. More news announced on the second day came from BMA Technology (Stand E6030), which has signed a contract to deliver and integrate systems for the world’s first completely battery-powered tugboat. As a partner in the project, BMA is responsible for designing, engineering, project managing and commissioning the complete power and propulsion systems. Designed and built by fellow exhibitor Navtek Naval Technologies (Stand 4098), the NV-712 ZeeTUG (which stands for Zero Emissions Electrical Tug) will be powered by two 712kWh lithium-ion battery systems and two 968kWe electric propulsion motors. It will feature power drives, an energy management system, integrated alarm monitoring and control system, and onboard electrical installation. Visitors to the 2018 Electric & Hybrid Marine World Expo can experience what the zero-emission tug’s deck, engine and battery rooms will look like via a virtual-reality headset at Navtek’s stand. Elsewhere on the show floor, lithium-ion battery system provider Forsee Power (Stand E7030) showcased its newly expanded product range, with its fully integrated Zen 35 and Pulse 15 battery packs taking centre stage. Equipped with an identical format and their own integrated battery management systems, both packs are designed for easy integration. Zen 35 provides a high-energy discharge, allowing for a day of operations in complete autonomy; Pulse 15 offers high power for fast charging. These new battery systems will be produced at the company’s new manufacturing site in Poitiers, France, which, upon opening at the end of 2018, will enable Forsee to begin mass production of its batteries and expand its production capacity by a factor of 10. More than 100 jobs are expected to be created this year, and around 300 by 2021, before any extension to the plant. The new 15,000m2 facility – a former diesel engine piston plant – will initially run three automated production lines. All the roofs of the plant and its car parks will be covered with photovoltaic panels to generate 1.8MW of electricity to power the facility, with the surplus redistributed into the main grid. 10,000m2 of additional land will be held in reserve to facilitate growth of the company over the medium term. The third and final day of the 2018 World Expo opens tomorrow (Friday 29 June) at 11:00hrs and closes at 16:00hrs. Watch the Electric & Hybrid Marine Awards presented live at 13:15hrs within the Technology Presentation Area. Wednesday 27 June 2018: Visitors to the fifth annual Electric & Hybrid Marine World Expo, which opened today at the RAI Amsterdam and goes on until Friday 29 June, have been greeted by the event’s 130+ exhibitors displaying numerous state-of-the-art marine propulsion technologies and making exciting news announcements. Among the innovations grabbing attention on Day 1 was Torqeedo’s (Stand E3000) range of electric and hybrid drives from 0.5-100kW for commercial applications and recreational use. And it’s from this range that the company is supplying an integrated electric propulsion system to a new aluminium solar-electric passenger ferry due to enter service on Spain’s Mediterranean coast later this summer. The 18m (59ft) ECOCAT has been built by the Metaltec Naval shipyard in Cantabria, an autonomous region on Spain’s north coast. It runs purely on electricity generated by 120 photovoltaic solar panels on its roof. The Torqeedo-supplied propulsion system consists of two 50kW Deep Blue electric motors driven by eight 30.5kWh BMW i3 high-voltage marinised lithium-ion batteries, with four installed in each hull. 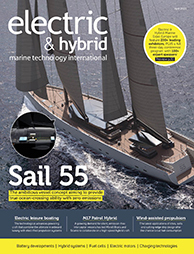 According to Torqeedo CEO Christoph Ballin, the BMW batteries are not water-cooled – as they normally would be in smaller applications – as cooling a bank of this size in a narrow hull and a hot climate would have required eight separate through-hull systems. With a top speed of 9.7kts (18km/h) and a normal operating speed of 7kts (13km/h), the 120-passenger boat has a cruising range of eight hours and its operators expect to average six 13km (eight-mile) trips per day. It is the first of Metaltec’s new ECOBOAT series of eco-friendly aluminium vessels. Elsewhere on the show floor, Japanese engine manufacturer Yanmar (Stand E6080) unveiled a working prototype of its new marine generator set, which is designed as a total electrical power and propulsion solution for workboats, small ferries and other vessels measuring up to approximately 24m (79ft) length. The new 400V generator set, which has recently rolled off the production line, delivers 17kW at 1,500rpm and is designed around the company’s four-cylinder four-stroke diesel engine. Water-cooled for quiet operation and coupled to a Stamford alternator, the skid-mounted unit is 1,545mm long, 876.5mm wide and 799mm tall. More news announced on the first day of the 2018 edition of Electric & Hybrid Marine World Expo came from Lithium Werks (Stand E8065), a provider of lithium iron phosphate cells, modules and scalable power systems, which shared details of its multi-year agreement with Dutch lithium battery manufacturer Super B. The agreement, which will secure worldwide supplies of lithium-ion batteries to both companies’ customers worldwide, will see Lithium Werks gear up its continuous supply of nanophosphate cells and Super B continue to expand its operations in response to increasing demand for lithium-ion batteries. On The Switch’s stand (E4030), the advanced drivetrain manufacturer announced that its parent company, Yaskawa Corporation, is making a multimillion-dollar investment in The Switch’s R&D capabilities and purchasing new equipment for its factory in Lappeenranta, Finland. This latest investment will enable The Switch to perform drivetrain testing up to 15MW, which, according to Jukka-Pekka Mäkinen, president and CEO of The Switch, is essential to execute the marine projects that the company is currently planning with customers. It also means that The Switch joins just a handful of companies that have the capability to test high-power machines at such a level. Meanwhile, Canadian energy storage system manufacturer Corvus Energy (Stand E2000), which is showcasing its latest-generation Orca Energy ESS, revealed that the product will be used to power shore stations in Brekstad and Valser in Norway for a fleet of new hybrid-electric ferries operated by Fjord1. Each shore station will have a capacity of 565kWh, charged from the grid with renewable hydroelectric power. The ferries themselves will also be equipped with 1,137kWh Orca energy storage systems as part of a diesel-electric propulsion system provided by systems integrator Norwegian Electric Systems. Normal operation will be all-electric, powered by the Corvus Energy solution, meaning the diesel engines will have limited use in docking, or in case of a power outage on the power grid, or during rescue operations. The World Expo is open from 10:30hrs tomorrow (Thursday June 28) and will be a free-to-attend networking drinks party held within the exhibition hall from 17:30hrs to 19:00hrs.